A very busy day in the Gem of the Peak with the car park full well before lunch. It was packed with people going to the Model Exhibition in the town and riding on the trains. 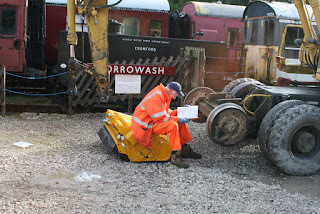 Down the yard, the apprentice was working on 51073 cleaning the underframe components and the Derby Lightweight Preservation Society held their AGM. Duffield Station had activity too, with the remainder of the blinds being fitted and lots of trunking being put in by the electrician. 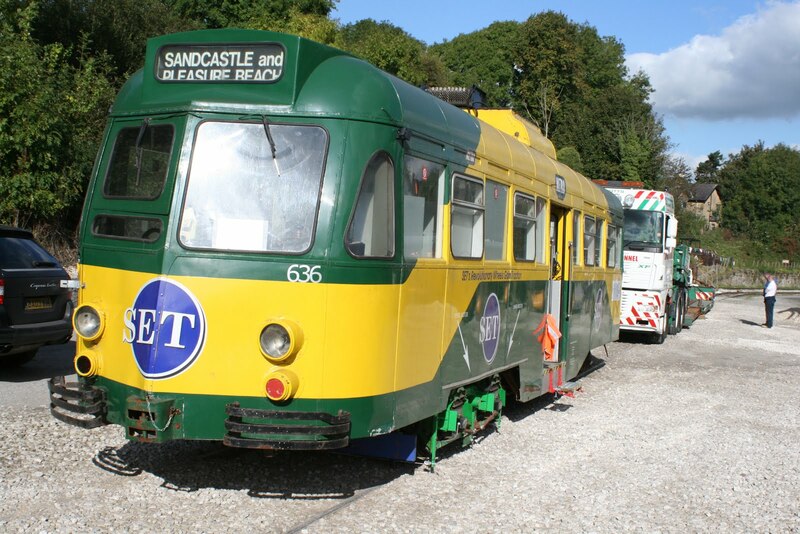 This evening we hosted another of our successful and popular Jazz and Chips Evening Land Cruise trains. Thanks to all who helped with this. Another good day of progress today inside the new Booking Office at Duffield with the team constructing the kitchen units and fitting the work top. This area isn't a food kitchen but just facilitates the teas and coffees at the station. Also, the majority of the new roller blinds were fitted to the windows which have been custom made to fit the windows. The new clock (heritage look) compliments the original Duffield name boards. 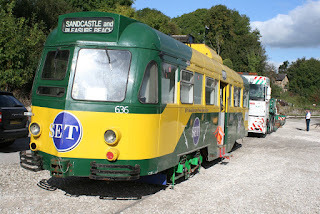 We also welcomed a Drive a Diesel Railcar Experience guest who enjoyed his time thanks to Chris and Richard. This also acted as a useful taxi for the plethora of packaging that new things come in these days. In the Wirksworth Booking Office there were smiles as a rather large Santa booking came in from a local establishment, helping things along nicely. I spent all day at Duffield where there was activity on the new Booking Office. This morning we took delivery of the kitchen units which will enable teas and coffees to be made. They look very good and hopefully they'll be installed tomorrow. This afternoon, the electrician was in full flow trunking out. In the chilly north, we welcomed a new testing company who has 12 trailers and 200t worth of weights to test so it was quite busy! 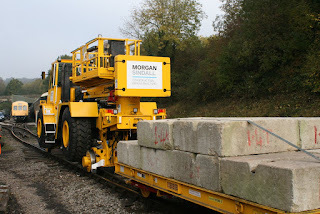 A look at today's test vehicle as it is unloaded and moved into rail mode. In the background is some of the equipment that is being assembled for further testing next week. A very busy Car Park. Dave Newby replaced two water heaters so the Ladies and staff toilet have hot water. For our female staff and passengers a hand dryer was installed in the ladies. My paper towel bill will soon be down to zero !! Early morning activities were hectic in the the lower yard when IRIS arrived but was the wrong way round after it's visit to the Dean Forest Railway. 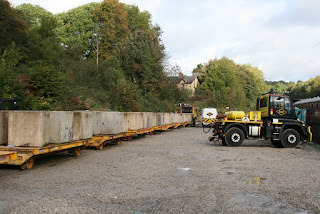 A large area was cleared of vehicles etc to enable the haulier to complete a full circle. Iris returned from her visit to the Dean Forest Railway today and required turning before unloading. 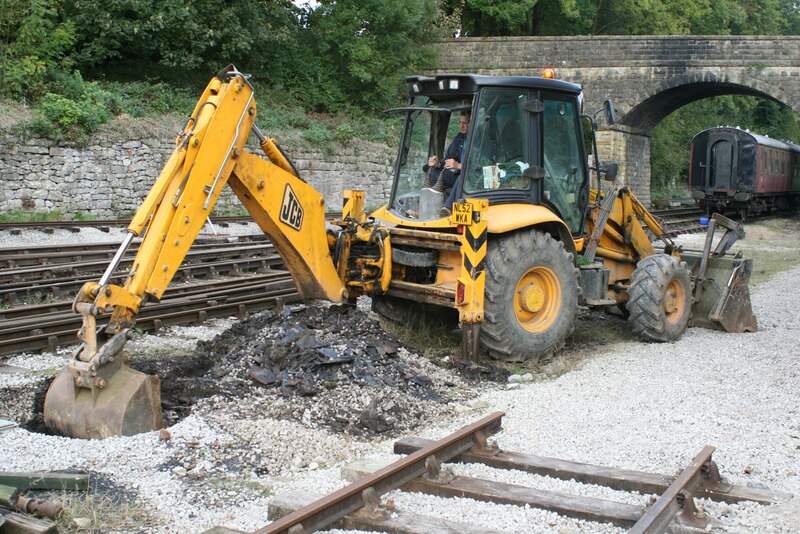 There are views of our new fork lift assisting with the discharge and the passing of the Steam Team's wheelbarrow! Yet again Sunday was busier than Saturday with satisfying loadings on all three trains today. Not record breaking numbers by any stretch but most satisfactory for October. Quite a few visitors today were travelling on vouchers issued by a well known internet site which is great because it proves they are doing their job! Indeed, this also helps out the buffet which also had a very strong day's trading assisted by some bikers dropping in on their way through the town. 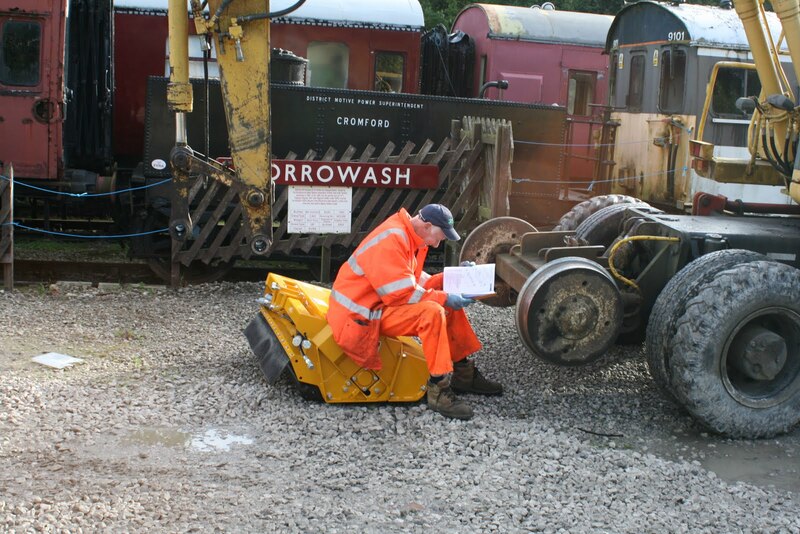 Down the yard, the Class 33 had it's speedo remedied and work continued on stripping the underframe of the Derby Lightweight power car. 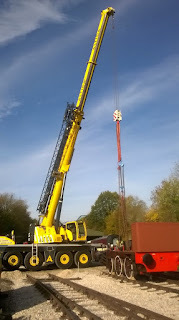 The PW Bubble had the north end cab assessed for which bit of metal to repair first following the removal of the fibreglass dome yesterday. Something was occurring on the Duke to keep Tim busy all day but you'll have to excuse my ignorance. Perhaps he'll pop up and fill you in! It was a busy time down at Derbyshire's favourite branch line today with the Wirksworth to Duffield service enjoying good passenger numbers for the time of year. Welcome to Arran Crawford who has joined the operational staff team as a third man and congratulations to Howard Lucas who was in charge of his first train today as a fully qualified guard. Down the yard this morning the Board of Wyvernrail PLC held it's monthly meeting in the training room and in the afternoon members of the L.M.S.C.A were in attendance for their annual general meeting. 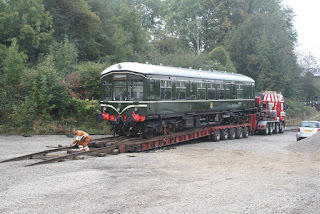 The DMU team set about steam cleaning the chassis of the Derby Lightweight together with the permanent way 'Bubble' which received some welding and had its northerly dome removed to allow further inspection. The class 119 also received attention and was made ready for an 'A' examination. 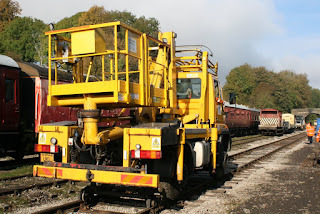 Rob and Aubrey undertook a number of shunts to ensure the three car DMU is readily accessible in preparation for next weekend's model railway exhibition and Jazz and chips evening. The Wirksworth booking hall was busy too taking bookings for Santa trains and the Jazz and chips special next. 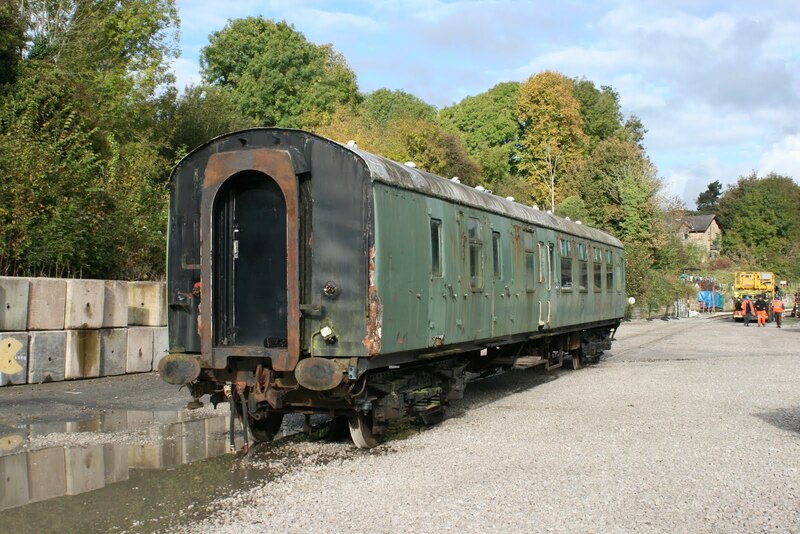 Down at Duffield Leigh continued the new booking office 'shop fit' in preparation for next week's grand opening (picture attached). Today's service was supported by the Pullman Buffett, EVRA shop and model railway. As an ISO certified factory, we specialized manufacture Mould making/ Sheet metal process/ Die-casting/ Precision stamping/ Machining parts, with strong competitive price and excellent quality, for more than 20 years. 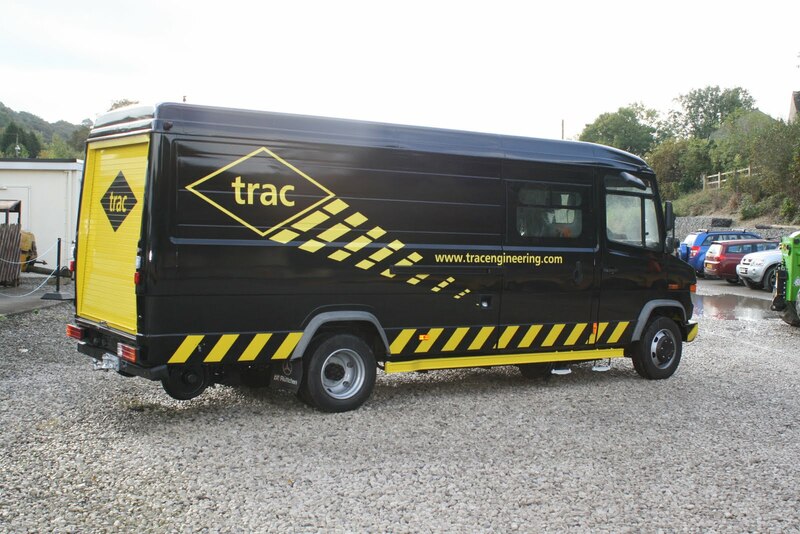 Any questions and enquiries will be highly regarded. Just email us the drawing and detailed requirement, you will get a complete quotation with technical analysis within 24 hours. I was the only one on site until half 10 when Derek rolled up to make some new condensation drains for the BSK. He was shortly followed by a new volunteer, who had popped along for his Induction. 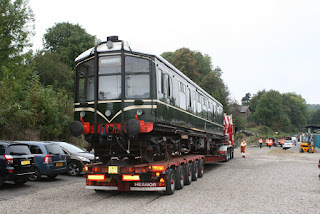 Things soon got more exciting by mid-afternoon as we welcomed a coach party who enjoyed tea and biscuits in the Pullman, followed by a chartered return to Ravenstor and a single to Duffield. They made their onward journey to Derby by East Midlands Trains. Thanks to everyone who offered their assistance with this. A nice sunny autumnal day but fairly sedate too. 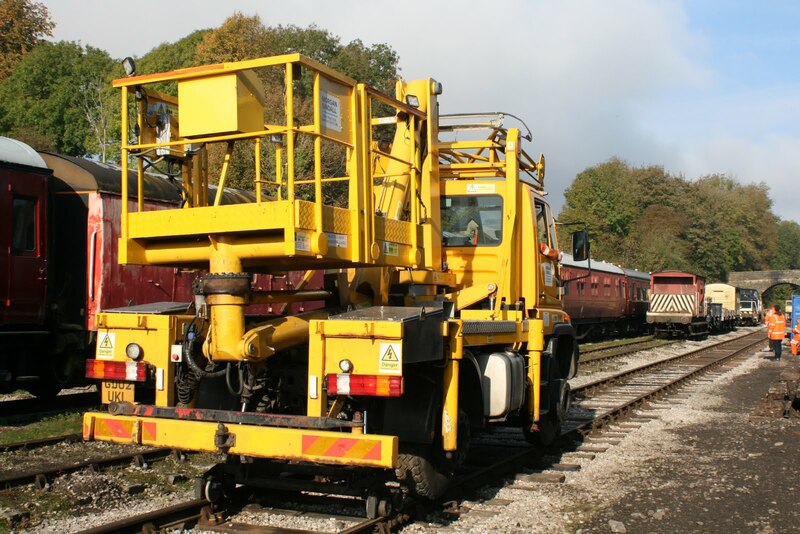 The maintenance types were out in force completing the A exam on 55006 and also removing the oil filters from LJ Breeze to take them to a supplier for a match. These are now becoming very rare but fortunately some were bagged for delivery next week. 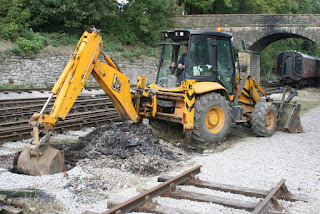 Bits and bobs of progress on the new Booking Office at Duffield took place whilst the Wirksworth Booking Office dealt with a pleasing number of Santa bookings (for the time of year). 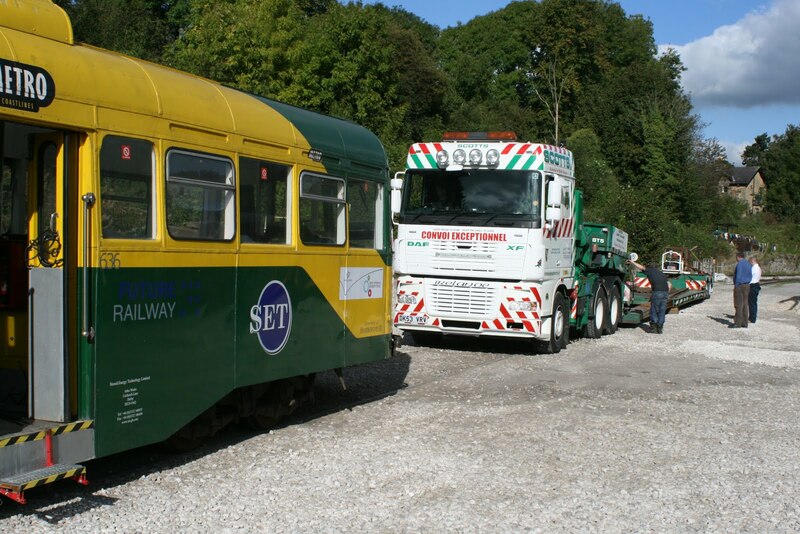 Our Wirksworth & District Tram departed for Derby today to receive some weather proofing and a new design of bogie. 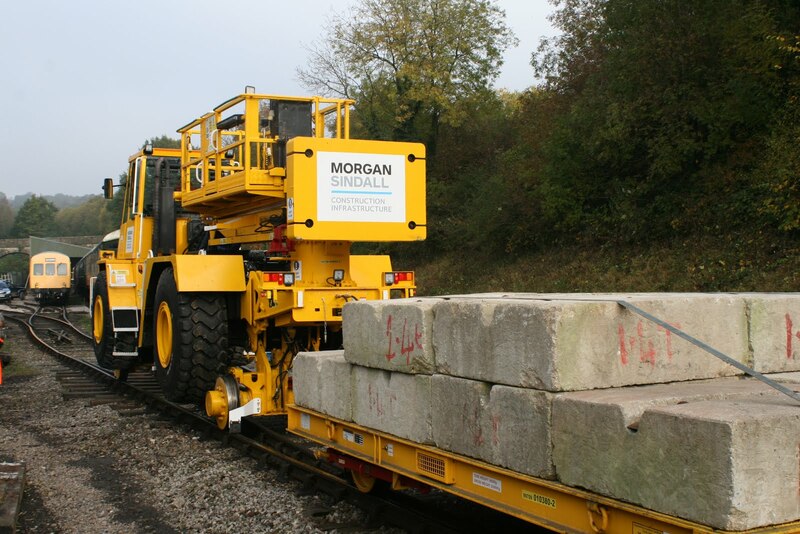 It will hopefully return after modifications that will allow it to climb West End with confidence. The haulier seemed less than confident and the process took up most of the day resulting in a departure during the school run!